You are here: Home / General / User tests: How well does Thomas Cook work on iPad? Tablets are a big deal for online retailers, with stats showing high AOVs and conversion rates, so it makes sense for websites to provide an excellent experience for users of these devices. Thanks to some user testing videos from whatusersdo.com, I’ve been looking into the user experience offered by Thomas Cook for tablet users. The user tests uncovered some serious problems with Thomas Cook on tablets, issues likely to cause customers to abandon the site. Users had to search for and book a summer holiday for themselves and their family, stopping at the last moment before purchase. They were then asked what one thing would have prevented them from making a purchase. The tests were carried out using a range of devices. There were five users, two on iPads, three on other tablets. The first four videos here show users on iPads. It seems that more high priority issues were uncovered on Apple’s devices. Since this device dominates the market right now, these are perhaps the most significant tests. Overall, users managed to complete the holiday purchase task, and many commented positively about the use of photos and choice of holidays. Technical errors, such as the site being slow, images not loading and the system freezing with an error message. Problems with pages not refreshing as expected. Problems with the navigation, including use of the browser back button. Some users could not read the full Ts and Cs as there was no means to scroll through them on their tablet. Interacting with the calendar proved difficult for many users. This becomes more frustrating, as the user’s attempts to zoom in to make the links clearer lead to the menu disappearing. In general, the size of links and the space around them is a problem issue on tablets, and adapting to touch screen devices and the ‘fat finger’ problem is one area where sites can improve. Elsewhere on the site, the links to choose from different hotel rooms are too small and too close together, meaning that it is too easy to make a mistake. This user is unable to view photos of the hotel and video content on her iPad. If she cannot view photos of the hotel, then making a decision is much harder. In the exact questionnaire, the tester cited this as an issue which would have stopped the purchase, as she would have to check them on a PC later, and may then end up on a different site. In this video, just as the user is heading towards the payment page, she gets an error message saying the identity of the server cannot be verified. As the tester says, outside of the test environment, she would abandon the process after seeing such a message. This may have nothing to do with the fact that a tablet is being used but, whatever the reason, it’s a conversion killer. This is one area where many sites can improve for tablet users. Input areas are often too small, drop-downs can be awkward to use, and if options are too close together, then users can easily make mistakes. The lack of attention to detail on the forms the inputs were far too small and it didn’t bring up shortcuts like the correct keyboard etc. Some of the information could have had an auto population feature also. While most e-commerce sites do work reasonably well in iPad, and the relatively high conversion rates are proof of this, there are areas where retailers can improve. Retailers should be looking at their visitor numbers, as an upward trend in visits from tablets may indicate the need to optimise. After this, they should be seeing how their website works on an iPad, by trying it themselves, conducting user tests like this one, and looking at abandonment rates for tablet users. In the case of Thomas Cook, though most of the site works well enough on an iPad, there are enough problems here to cause users to abandon purchases. 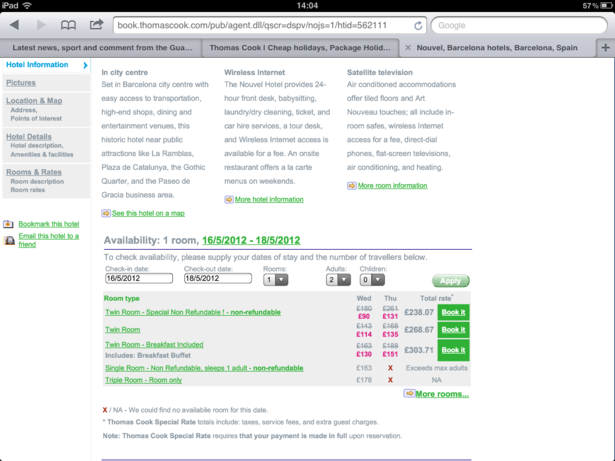 When this is a holiday for £2,000, then you can see how an investment in testing and optimisation could pay off.